Perfect for warmer months, this stylish grey blazer by Country Road will have you looking put together for all your events. The classic grey blazer features a double-breasted silhouette and has side welt pockets with flaps. 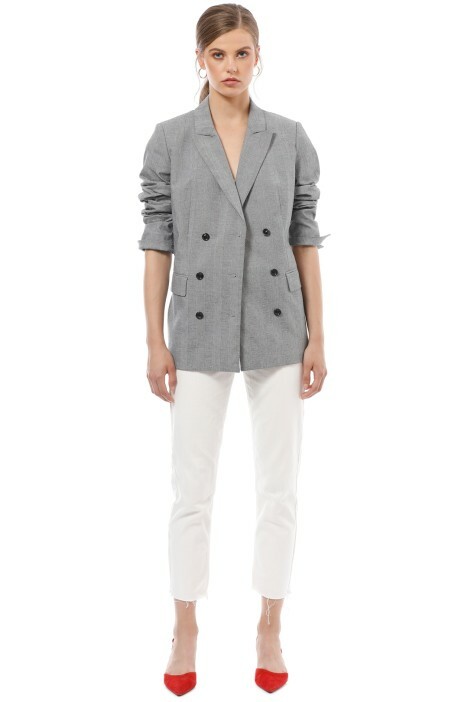 Cut for a relaxed fit, rent this versatile blazer for a daytime event or a work function. For a chic daytime look, style it with a white bodysuit and a pair of denim shorts. Style your hair in beach waves and hire a headwear piece to complete your look. Head over to our blog and read our post on how to transform your day look for a night out! Established in 1974, Country Road is one of Australia’s first lifestyle brands that has since expanded into a fashion brand for men, women, and children. With consistent fits and high-quality pieces, Country Road designs for the modern woman who knows her personal style and enjoys experimenting with new trends. With hundreds of stores across Australia, Country Road is a trusted destination for stylish pieces. LENGTH: This coat ends below the hip. Check Double Blazer is rated 4.0 out of 5 by 1. Rated 4 out of 5 by Emily from Material very stiff This blazer was nice, but the material was super stiff/starchy to the point of feeling a bit odd.